There are 57 National Historic Sites in the city, many of which focus on the Assiniboine and Red Rivers, bodies of water that have played a crucial role in the growth of this Western city, to say nothing of the French influence at St-Boniface, otherwise known as “The French Quarter of Winnipeg”, comprising the single biggest Francophone community West of Quebec. A soft serve snack might be just the ticket. What the locals refer to as the BDI is otherwise known as the Bridge Drive-In. It has a 55 year history selling the best ice cream and soft serve in the area, which make it a Winnipeg institution worth a visit. Tip? Try the Sleeping Beauty, a two sundae delight in a hollowed out pineapple half. If you want to eat local, you’ve got to have some pickerel and one of the best places to do that is Fusion Grill. It’s all about fresh, organic and local with Fusion, including their “Panko crusted pickerel cheeks with beet slaw, crème frâiche & Northern pike caviar”. If you’re more of a meat eater, a bison rib eye might be your best bet. At lunch, the local favourite is, not surprisingly, the Panko crusted pickerel cheeks with crispy yam frites & pickled lentil tartare sauce. Hungry yet? This gorgeous bistro boasts a Canadian focused wine list and while it’s not the cheapest place to eat in the Peg, it will indeed be memorable. If you’re looking for something light with that feeling of home made, check out one of several locations of Stella’s Cafe. From all day breakfast, to soups, sandwiches and burgers, all made with fresh ingredients, it’s worth a stop. Tip? The Chickpea Curry with Stella’s own Peach Chutney? Supposed to be worth the trip alone! The place where the Assiniboine River flows into the Red River is known as the Forks. While that’s a relatively new name, the location itself has been a meeting place for over 6000 years. Beginning with early Aboriginal peoples and throughout history, including Metis hunters, European settlers, river and railway workers and immigrants, almost all have come through the Forks at one time or another. 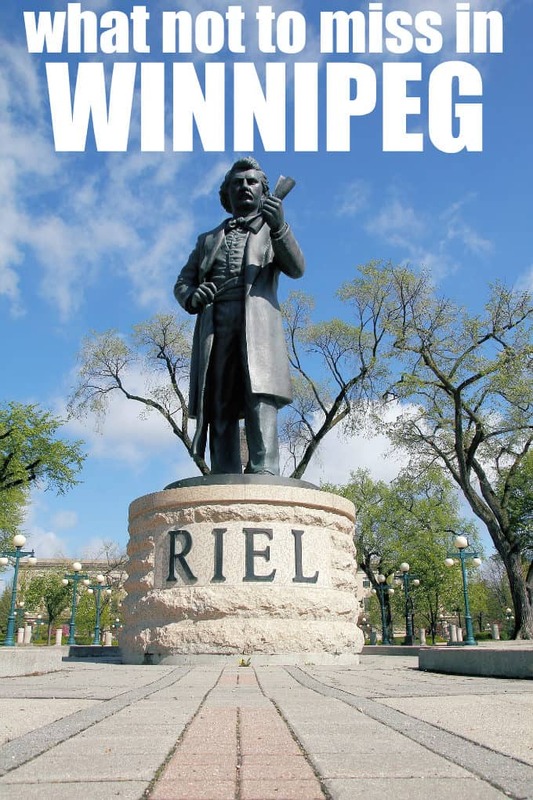 Today, it is a must see destination in Winnipeg with a year round variety of events, a historical interpretive park, skateboard par, historic port, a variety of entertainment venues, dining options, and attractions. Since history is the name of the game in Winnipeg, get some outdoor time—647 acres worth—at FortWhyte, where you can have a close encounter with a bison herd, walk trails, visit a pioneer sod house, check out the tipi encampment, floating boardwalks and more. It’s a typically Canadian experience, in the heart of the country. Are you interested in where your money comes from? The Winnipeg location of the Canadian Mint has tours with coin displays and an exploration of how money is made. You can learn how strips of metal turn into 1000 coins per second! And no, they don’t let you take some home with you, unless you visit the gift shop! For interactive learning and fun, the Manitoba Children’s Museum is a great way to spend a rainy day! Kids, big and little alike, can experience hands on play and investigation that are entertaining and educational, all at once. Learn about how trains run and tunnels change perceptions! Assiniboine Park and Zoo is a sprawling series of fabulous attractions that everyone in the family can enjoy, including the well known Assiniboine Zoo, a flower conservatory, gardens, playgrounds and even a steam train, for when your feet need a break! The butterfly garden is a lovely way to tone things down or if you’re in a Manitoba spirit, visit the ‘Journey to Churchill’ exhibit to get a first hand view of life in more northern climes, including polar bears, a view of the northern lights in the Aurora Borealis domed theatre and more! Winnipeg has cultural and arts events all year around, so it’s worth doing a little digging before you arrive and plan your trip to include something special. Whatever you choose, there will be history and culture, fun and adventure, waiting for you where the Assiniboine meets the Red River… Bon voyage! You might also like these travel gifts. Winnepeg sounds like an awesome area to visit. Thank you for the great list. I always felt Winnipeg is a lovely city. I lived fairly close to Winnipeg for 4 yrs and was often there to do some shopping or such. There really are a lot of good food places there as well as cultural things to see. I lived in Winnipeg before moving to BC (15 years ago) and one of the things I loved was the Folk Festival! They also have AMAZING Chinese food restaurants there! Thanks for the tips,i would love to visit the Bridge Drive-In. We love the children’s museum there! So fun! Thanks for featuring Winnipeg; I don’t see many people talking about it online and its a great city. I have been a few times and I have always had a great time exploring its cultural and historical sites. Someday I’ll get up there. Looks like a nice place to visit. Thanks for featuring my great city! I love it here and there is so much to see and do! It definitely isn’t all about the cold! The Bridge Drive-In sounds like a wonderful place to take the kids for some good eats! I have never been to Winnipeg so hopefully one day I will get to go! I want to go to the Bridge Drive in and try the food in Winnipeg! I would love to take a summer trip to Canada! Such a pretty country. Winnepeg sounds like an awesome place to visit. I would love to travel across Canada someday. I have heard that Winnipeg has some great restaurants. I’d like to try them out. I remember visiting and taking our kids to the zoo which they loved.